We love to have hot paranthas off the tawa, especially during the winter months. 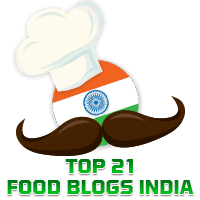 In this blog, I have a fairly large collection of recipes for paranthas of different types such as Aloo Parantha, Palak Parantha, and Gobhi Parantha, amongst others. For readers not familiar with Aloo, Palak, and Gobhi, these are Potatoes, Spinach, and Cauliflower respectively. 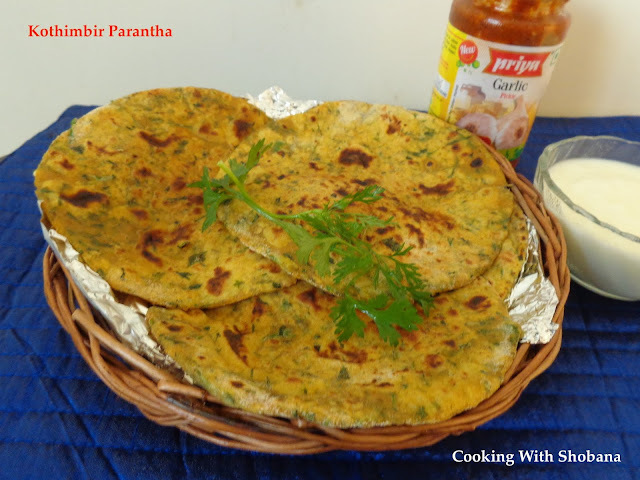 Today's recipe is for Kothimbir Parantha which I learnt from a Maharashtrian friend. In this, we use kothimbir ( the Marathi word for Coriander Leaves /Cilantro). In Konkani, we call them Kothambari Pallo, in Hindi they are called Dhaniya Patha, and Kothambari Soppu in Kannada. Apart from being aromatic, coriander leaves also have numerous health benefits as seen from this article in the Times of India. I have served today's Kothimbir Paranthas with curds and store bought Priya Garlic Pickle. Pluck the coriander leaves from their stems and wash them thoroughly. In a large bowl, combine the atta, 1 tsp of oil, chopped coriander leaves, jeera powder, grated ginger, haldi and chilli powder, finely chopped green chilli and salt.